After suffering for many years as King Henry VIII tried to extricate himself from his marriage, Catherine of Aragon died at Kimbolton Castle on January 7, 1536 at the age of fifty. King Henry himself chose Peterborough Abbey as Catherine’s final resting place. He ordered that she be buried with all the honors due to the Dowager Princess of Wales and gave enough money to provide her with a magnificent state procession with many noble ladies present. Catherine’s body was embalmed with spices, wrapped in waxed linen, inserted into a chest, and lay under a canopy of state for some days. The body was then enclosed in lead and put in a coffin. This was placed in a chapel before the altar, surrounded by dozens of burning candles which were perpetually lit. Surrounding the coffin were four crimson banners with the arms of England and Spain and four large golden standards with the images of the Trinity, the Virgin Mary, St. Katherine and St George. The arms of England were not gilded and the crown over them was the unclosed circlet of a princess, not the closed crown of a queen. During the two weeks of mourning, the clothing for those who were participating in the procession was manufactured and once this was finished the funeral could commence. It began on January 29. The chief mourner was Eleanor Brandon, Countess of Cumberland, the daughter of Charles Brandon and the king’s late sister Mary Tudor. The Duchess of Suffolk, Catherine Willoughby, Brandon’s current wife, Lady Bedingfield and thirteen other noble ladies, along with fifty of Catherine’s serving women followed the hearse to Sawtry Abbey. The entire party rested here overnight with the coffin in the chapel surrounded by more burning candles. The next day the company of mourners left Sawtry, this time accompanied by forty-eight poor men in black hoods and robes carrying torches. They made their way to Peterborough Abbey. The coffin was placed in the abbey, surrounded by a thousand burning candles, on the lowest step of the high altar while six hundred women who had been given black robes to mourn for Catherine noticeably prayed for her as Queen. The walls were covered with the banners of all the great houses to which Catherine was related. These included Spain, Aragon, Sicily, Portugal and the Holy Roman Empire. Also included were the arms of the House of Lancaster and the white escutcheon of Prince Arthur and banners with Catherine’s symbol of a pomegranate. Around the walls were large gold letters spelling out her motto “Humble et loyale”. John Hilsey preached the funeral sermon. Hilsey had replaced the executed John Fisher as Bishop of Rochester and was loyal to King Henry. His sermon was an assault on the pope and on Catherine’s alleged marriage. During the sermon he stated Catherine had acknowledged at the very end of her life that she had never been the rightful Queen of England. This was patently false and nobody in the audience believed it. Catherine had never wavered in her belief that she was the king’s wife and Queen. She was then lowered into her tomb in the abbey. Catherine and Henry’s daughter Mary considered the service to be dishonorable and advised the Imperial ambassador Eustace Chapuys to not attend. He gave as his reason that Catherine was not buried as a Queen. Henry announced his intention to erect a fine monument in Catherine’s honor. He delivered on his promise and a beautiful tomb was built. Nothing remains of this monument as it was destroyed by the parliamentary troops of Oliver Cromwell during the English Civil War. For many years it was believed that Catherine Willoughby was interred with Catherine and in 1777, the grave was opened to verify this, revealing there was only one coffin in the tomb. It was agreed that to open the coffin would be disrespectful but one of the witnesses drilled a hole in the coffin, sliding a wire into the opening. He hooked out a section if black and silver brocade from Catherine’s robes that smelled of embalming fluid and disintegrated once it hit the air. The coffin was reburied and has not been disturbed since. 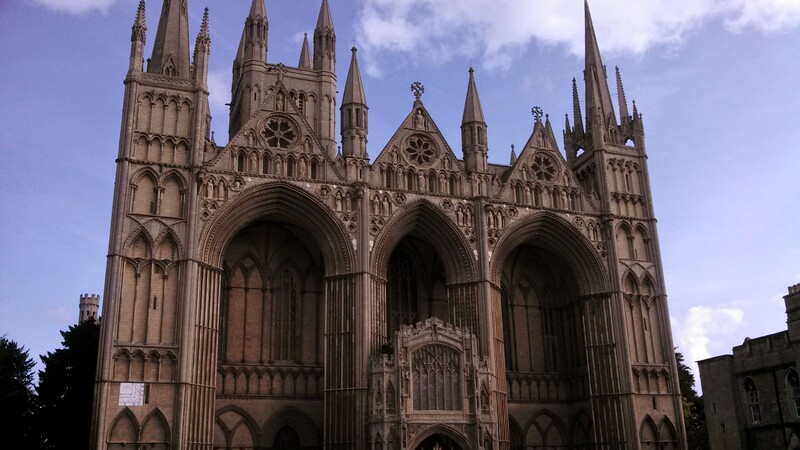 The present tomb was restored and altered during an extensive renovation of what was now Peterborough Cathedral during the Victorian era. Queen Mary of Teck, the wife of King George V, ordered symbols of queenship be placed on the tomb. To this day there are banners above her grave depicting the arms of a Queen Consort of England quartered with those of a Spanish Infanta. What a fun read! I enjoyed the detail and thoroughness. I wonder what pressure was brought to bear on John Hilsey about what his sermon had better say. Of course, having succeeded the executed John Fisher, probably nothing needed to be said. Plus he was loyal to Henry in the first place. It’s interesting that the ceremony had to wait until everybody could be dressed in the suitable mourning clothing. I didn’t know that interesting detail about John Hilsey lying about Catherine stating she had never been rightful Queen! Some people just never let things go do they!? 😉 Great stuff. Though Henry VIII tried to cover up the truth, he was out done in the end as no one believed his lies and justice was done. I am very happy that Catherine is honored to this day and the full truth is known. I visited Peterborough Cathedral coincidentally around the time of Catherine’s death in January and was greeted by a visiting Spanish cleric. On her tomb had been placed flowers and pomegranates; her heraldic badge. The original tomb of Mary Queen of Scots, her body having been subsequently moved to Westminster Abbey, opposite, on the other side of the alter, was undecorated. Mary Stuart was no where near as honorable woman as Catherine of Aragon. I am glad Catherine has respectful visits from representatives of Spain. Good post. Spanish visitors come to the Abbey to this day to lay flowers on the tomb. Peterborough Cathedral holds a Katherine of Aragon Festival every year at the end of January to mark her death, There are re-enactments and visiting speakers. This Queen has a loyal following to this day. Wonderful to hear that! It may be centuries later, but Catherine is at last getting her overdue respect. Thank you for that information! Ah, good for Mary, Queen of George V! 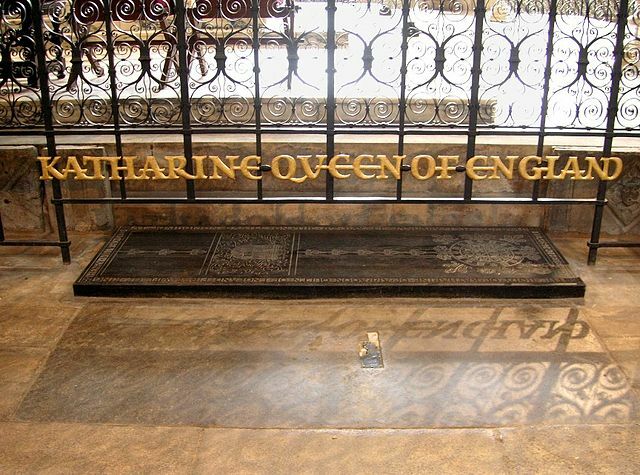 Was anything attempted by Mary I to correct Henry’s attributions for Catherine’s tomb? I would presume Elizabeth I or the Stuarts would have removed them, if there were any. Just wondering. Very nice read, and another fine tribute to the victims of Henry’s quest for a son! Thank you! Re your point about the Stuarts – Mary Queen of Scots was also buried in Peterborough Cathedral (as it is now called, following the dissolution of the monasteries). Her son, James I, the first Stuart king, had her removed and placed in Westminster Abbey but he did nothing about Queen Katherine.